I cannot count how many times in my life as a developer that I have been contacted after a deployment by a client that is unable to see any of the changes that were deployed (or something isn't working). There are a variety of ways to respond to this but it usually involves a process of holding a key and pressing another or going into options. I'm not terribly fond of this process, but thankfully the latest release of ASP.NET allows me to easily get rid of this issue quite easily through the use of TagHelpers. Caching issues generally result from a browser holding onto an older version of a file after it has been changed. This is usually a good thing for everyone as the server is happy because it doesn't have to serve out a file that it has already served to a client and the client is happy because they experienced zero load-time for the file. It sounds a bit like a win-win scenario, however, when some of these files that were being cached are changed after a release or deployment, things can go horribly, horribly wrong. Non-cached objects of an application will now be talking to older versions of files, script files may be relying on DOM elements that either no longer exist or simply don't exist yet, CSS rules can change and cause your application to look strange or worse, your application may not simply work at all. Developer: "Well, we deployed the update this morning. Everything should be working along with all of the new features." Client: "I just tried accessing it and everything looks funny, besides that, nothing seems to work." Developer: "You may need to clear your cache for the changes to take effect." 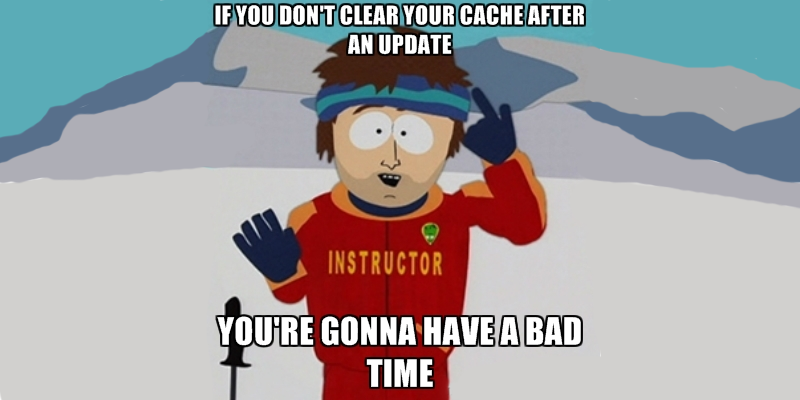 Client: "Cache? Haven't I paid you folks enough already?" Developer: "No, the cache in your browser. It's storing the older files prior to the update and you need to get rid of them." Client: "Well how do I do that?" Developer: "You can either go into Options within your browser and choose the Clear Temporary Files option or hold the CTRL key and press F5. You should see a flicker and then it should work." Client: "Yep. I just did that and it seemed to fix it. Now do I need to do this every time that I open the application or site?" The issue with this scenario is that it should not be the responsibility of the end user to have to clear their cache every time something happens. Files are cached in different configurable ways, but the most common case where a file is being cached unnecessarily is also the most common way the file is referenced. There isn't really anything wrong with this - and if caching is enabled after the first time it is requested, the jquery.js file will be stored locally within the cache and will not be requested from the server again. As I mentioned earlier, this is great as it reduces overhead to the server and will speed up load times since the file is being accessed locally. The problem comes in when the developer decides to upgrade the version of jQuery and we aren't generally talking about minor updates which will not introduce major breaking changes, but let's use the leap from jQuery 1.x to jQuery 2.x. This release changed all sorts of APIs, removed support for older browsers and did quite a few other things that could break an application. Now if the user has the previous version cached and you revisit the application after changing quite a bit of your markup, the newer markup should be picked up, but the older jQuery file is still going to be used, which is not what we want. This will append a timestamp to the end of your jQuery request each time. The server uses the querystring parameters to differentiate between individual requests and thus it would load your jQuery file from the server every time. Sure, this resolves the issues of always serving the user the proper file, but it is terribly inefficient. It negates all of the benefits of caching and simply results in longer load times and additional server overhead. This is commonly referred to as "cache-busting" and it's a nice balance to strike when deploying new versions of an application. Basically, once a release is pushed out, you'll simply need to update the version number for your application and it will automatically pull the latest versions from the server and cache them (ignoring the older versions entirely). One of the most interesting features of ASP.NET MVC6 is the introduction of TagHelpers. Now this post isn't a crash course on them, but if you want to learn a bit more, I'd recommend reading through Jeff Fritz's blog post on them here and this MSDN article on them. In a nutshell, TagHelpers allow developers to use a bit of magic within their ASP.NET MVC Views and are really designed to be cleaner, better versions of the existing HtmlHelpers that are used today. With regards to cache-busting, there is going to be one specific attribute that we will be discussing, and that is the asp-append-version attribute. With the use of TagHelpers, simply appending this attribute will function similar to the versioned cache-busting approach mentioned above. That's it. Simply append asp-append-version="true" to any <script>,<link> or <style> tag and it should add a querystring value that corresponds to a specific version of that file. It's easy. There's no server-side code to add or values to adjust, simply append a single attribute and it works. It's automatic. You don't have to worry about manually updating a version for your project, since the version is based off of the file itself, .NET handles all of that for you. No more calls. Since this handles busting the cache, you don't have to worry about clients calling complaining that "things look weird" as this will ensure they are served the proper file. It's smart. Another benefit that this approach offers over some of the alternatives is that it will only bust the cache for files that need it. If your site.css file didn't change since the last deployment, it should still be cached and its version number shouldn't change.